, an ingenious botanical painter, the son of the prince of Baden Durlach’s gardener, was born in 1710, and very early shewed a taste for drawing, and painting the flowers of the garden. Although he received no instructions, yet such was his proficiency, that, whilst a very young man, he had painted 500 plants with a skill and accuracy that was almost unexampled, under the disadvantages of so total a want of instruction as this young artist had experienced. His merit, however, remained long unknown, or at least ineffectually noticed, until it was discovered by a gentleman of curiosity and judgment, who visited the garden of which his father was the superintendant. Fortunately for young Ehret, this stranger was a physician and a friend of the celebrated Dr. Trew, of Norimberg, to whom he justly supposed these paintings would be acceptable. 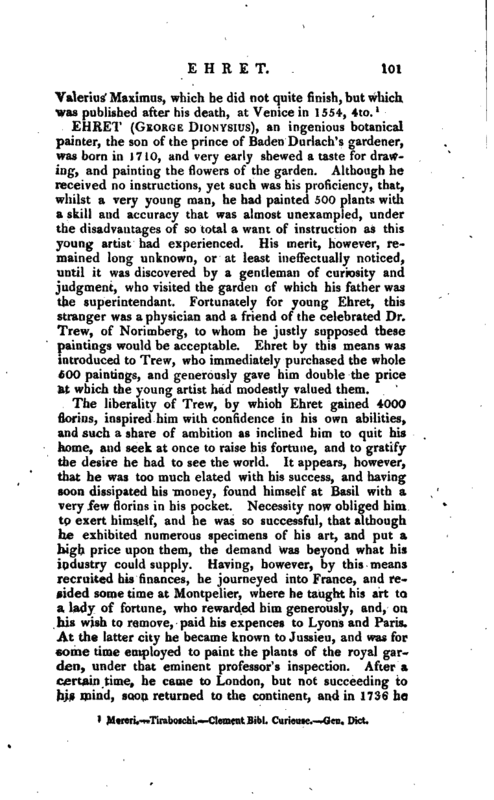 Ehret by this means was introduced to Trew, who immediately purchased the whole 500 paintings, and generously gave him double the price at which the young artist had modestly valued them. The liberality of Trew, by which Ehret gained 4000 florins, inspired him with confidence in his own abilities, and such a share of ambition as inclined him to quit his home, and seek at once to raise his fortune, and to gratify the desire he had to see the world. It appears, however, that he was too much elated with his success, and having soon dissipated his money, found himself at Basil with a very few florins in his pocket. Necessity now obliged him to exert himself, and he was so successful, that although he exhibited numerous specimens of his art, and put a high price upon them, the demand was beyond what his industry could supply. Having, however, by this means recruited his finances, he journeyed into France, and resided some time at Montpelier, where he taught his art to a lady of fortune, who rewarded him generously, and, on his wish to remove, paid his expences to Lyons and Paris. At the latter city he became known to Jussieu, and was for some time employed to paint the plants of the royal garden, under that eminent professor’s inspection. After a certain time, he came to London, but not succeeding to his mind, soon returned to the continent, and in 1736 he | was employed in the garden of Mr. Clifford, where Linnaeus found him, and gave him some instructions in the principles of the sexual system. His fine taste and botanical accuracy appear to have been first publicly displayed in the figures of the “Hortus Cliffortianus,” which appeared in 1737. 1 Pulteney’s Hist. 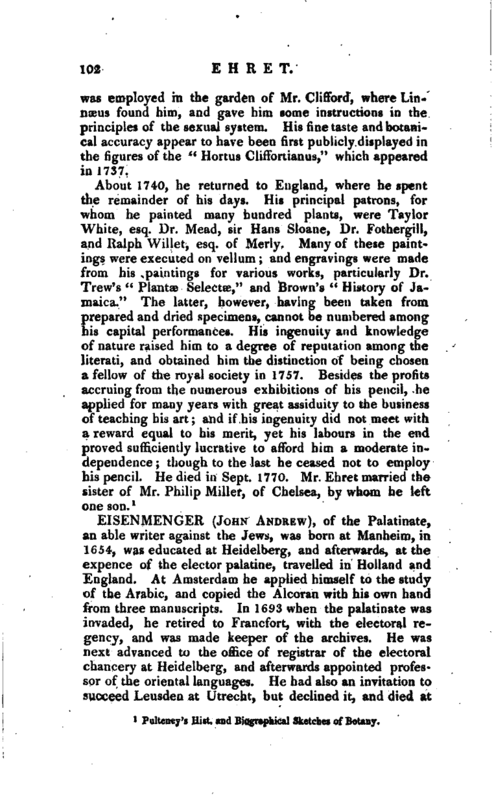 and Biographical Sketches of Botany.